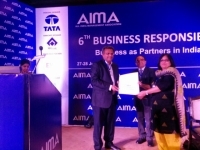 The Paperboards & Specialty Papers Division's case study on "Eco Certified Products Sales" has won the All India Management Association (AIMA) award for the "Most Relevant Project" in the Business case study contest, organised as part of the organisation’s 6th Business Responsibility Summit held on June 27 and 28, 2014. A total of 42 case studies were submitted by companies from various sectors like FMCG, Foods, Beverage, Power, IT, Telecom, Paper and Infrastructure as well as NGOs. Ernst & Young were the knowledge partners for the jury. The theme of the summit was "Business as Partners in India's Development". It was attended by corporate CSR teams, NGOs and government representatives working in the field of nutrition, water stewardship, equal opportunity and transparency. The summit deliberated on how CSR was transforming from Corporate Social Responsibility to Corporate Strategic Responsibility.